Michael Watts was all smiles Friday as classmate at the Arizona Center for Comprehensive Education and Life Skills (ACCEL) pulled him on a dolly through a forest of pool noodles dangling from playg round equipment. At a DJ booth blasting music, another student, Eric Robinette, grabbed a microphone and sang along. Then there was the sponge relay, bounce house, bowling, obstacle course, baseball and basketball games and a Super Soaker station. Laura Montgomery, a therapy coordinator at (ACCEL), said these and other activities offered at D-Backs Day helped students, who have developmental disabilities, with fine and gross motor skills. “We want these kids to be working together and engage in teamwork,” she said. A donation from the Arizona Diamondbacks made D-Back Day possible, and the team’s organist, Bobby Freeman, performed Thursday. The event sets up National Developmental Disabilities Awareness Month in March. 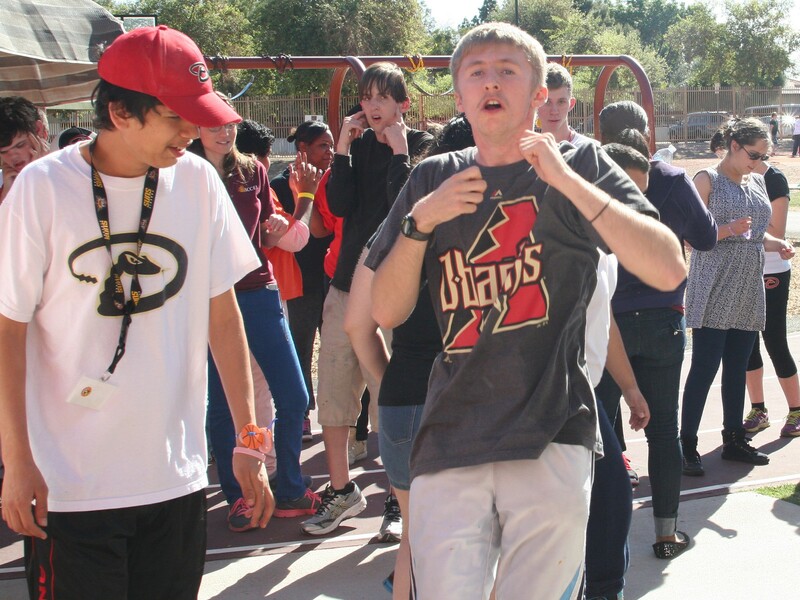 ACCEL, with campuses in Phoenix and the East Valley, is a private, nonprofit organization educating those with special needs. 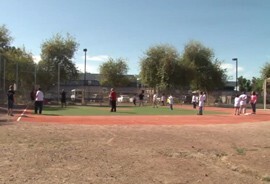 The Diamondbacks also provided a grant for the Metro Campus’ baseball field. Watts, is set to graduate from ACCEL this year, said he enjoyed being outdoors and having fun with his classmates. When he wasn’t grooving to songs including Michael Jackson’s “Thriller,” Robinette said he enjoyed bowling and baseball. “In baseball, we won. I like being the pitcher,” he said. Montgomery said the event allowed students to develop skills while having fun. Cheering each other on, for example, helps them with core language skills, she said. “We want to help the students generalize their skills in another environment,” Montgomery said. The Arizona Diamondbacks converted part of their spring training facility into a space where kids could experience the benefit of working in teams to refine their motor skills – and having fun in the process. Eric Robinette (center) and Michael Watts (left) participate in D-Backs Day at the Arizona Center for Comprehensive Education and Life Skills in Phoenix.